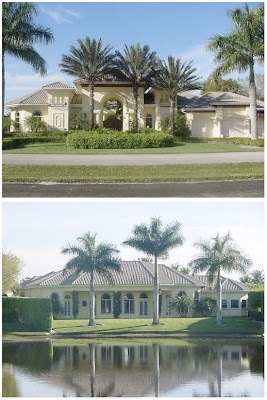 YOUR MAMAS NOTES: Last spring, in May of 2008, music legend Bruce Springsteen scooped up a single story house in the horsey enclave of Wellington, FL for $3,100,000. A few months later he snatched up the house next door for another $4,600,000. Fast forward to March of 2010 when, thanks to the clever sleuthing of Vlad the Revealer Your Mama has learned that Mister Springsteen recently listed the first house for sale with an asking price of $3,950,000 and just this week sold it at a loss. More on that loss later. Mister Springsteen needs no further expounding, his name alone conjures up all that one needs to know about the gravely voiced American music icon who has sold more that 120,000,000 albums worldwide, won 20 Grammys, 2 Golden Globes and a damn Academy Award . What does, perhaps, need some explaining is why Mister Springsteen and his wife Patty Scialfa would buy not just one buy two side by side residences in the heart of South Florida's equestrian world. A few minutes clicking and clacking around on the interweb and we turned up several articles that discuss the couple's teenage daughter Jessica who happens to be one of the top junior equestrian riders in all of the U.S.A. who trains, competes and kicks booty at the Palm Beach International Equestrian Center. Previous reports indicate that prior to purchasing a home in Wellington, the Springsteens rented a house in the gated community that's attached to the Palm Beach International Equestrian Center. When the house next door to their rental became available to purchase, they forked over $3,100,000 for the single story house that property records show measures 5,496 square feet with 5 bedrooms and 6.5 poopers. For what it's worth, one listing Your Mama teased out of the interweb shows the house measures a much larger 8,949 square feet with 5 bedrooms and 6 poopers, a second listing as well as the Palm Beach tax man show it spans 7,862 square feet with 5 bedrooms and 6.5 poopers and yet another listing we dug up indicates the home spans 5,641 square feet with 5 bedrooms and 6 full poopers. Make of that what y'all will children. What does appear to be consistent across the listings is that the mock-Mediterranean style residence was built in 2002, sits on a .66 acre pond-fronting lot and is built around an interior courtyard of Saturnia marble with a heated swimming pool and spa. A three car, front facing garage opens onto a circular drive and the interiors are, according to listing information, professionally decorated. Since there are no interior photos included with any of the listings Your Mama found we're just going to have to take a leap of faith that the house was professionally decorated in a non-cringe worthy manner. Other features, according to the slim listing information available, include granite counter tops, a Sub-Zero refrigerator, and hurricane proof doors and windows, which is a good damn thing because hurricanes are to Florida what earthquakes are to California except devastating hurricanes happen far more more often. We're going to assume that Mister Springsteen and Miz Scialfa put some money into customizing and decorating the home, but a few flicks of the well-worn beads on Your Mama's bejeweled abacus shows that the New Jersey-based couple were hoping to cash in to the tune of $850,000 even though the Floridian real estate market has swirled down the terlit since they bought the property in the spring of 2008. Turns out they not only did not cash in on the sale of the property, they lost a bit of money. According to an article in today's Palm Beach Daily News, Mister Springsteen sold the property yesterday to a couple of Chicago-based philanthropists for–are y'all sitting down and ready for this?–$2,950,000. The loss of $150,000 plus real estate fees ain't nuthin' to a moneybags like The Boss, but even still it's never easy to watch $250,000 evaporate like mist on the wind. Anyhoo, the Springsteen family also owns the house immediately next door, which property records show the picked up in September of 2008 for $4,600,000. Based on previous reports, Your Mama thinks–but does not know for sure because we really don't know a iPhone from an eyelash–that this is the same house the family used to rent before buying the one next door that they've currently got up for sale. Are the children following? Records of file with the tax man show the house sits on a .65 acre pond front lot, measures 6,657 square feet. Interestingly, other online property records we peeped and poked around show the house measures 5,946 square feet and includes 4 bedrooms and 7.5 poopers and yet another property record resource shows it has only 4,535 square feet. Lo-wards have mercy children, all this confusion about house sizes down in Wellington, FL has our head spinning and a gin & tonic on our lips. The Springsteen's Wellington, FL home happens to be located in the same gated community where Glenn Close–whose daughter also rides the horsies–also owns a home. Wellington also claims homeowners Tommy Lee Jones and Georgina Bloomberg, that would be New York City mayor Mike Bloomberg's equine obsessed daughter. And, of course, we could never forget that hot to trot polo stud Nacho Figueras also camps out in Wellington when not in Argentina and everyone remember that Her Madgesty Madonna was hanging out in Wellington last year and everyone thought she was going to buy up a big house there but instead she headed out to the Hamptons where she paid somewhere in the neighborhood of ten million clams for Kelly Klein's filly farm. Mister and Missus Springsteen's primary residence is a large spread in Rumson, NJ and they also own a sizable home in Beverly Hills, CA that sits in the eastern shadow of Mike Ovitz's new and very modern Michael Maltzan designed monster mansion. Seems the Springsteen's make of habit of buying houses they once rented. They recently purchased such a place on the water in Lake Placid, NY. In addition to having hosted the Olympics a couple of times, Lake Placid in the home of a large equestrian event that their daughter competes in, and they reportedly purchased the house they used to rent during those weeks. Wow! The house is very beautiful! The view is amazing! Just speculating, but maybe he bought the extra house for recording? He could house his band and engineers in one house, daughter gets her horsies, they all avoid another cruel Northeast winter. Ah, must be nice. That's funny, I just drove up to the Ovitz pad yesterday to see how ungainly it is...and I'll tell you, it's exquisite and not at all IN YO FACE. I know it was HELL for the neighbors while it was going up, but the end result, well, it's gorgeous. Nothing to say about the Springsteen thing except my fascination at the way counter culture transitions to establishment in one generation. But you might also want to check out Nacho's and his family's pretty fabulous digs in another polo community outside of Buenos Aires in the new Elle Decor. From the article, you can surmise that both he and the wife are from old and rich Argentinian families (not surprising since they play polo. . .). But in fact the real surprise is that it turns out both of them are quite creative and artsy. Nacho, in fact, paints (sigh), and several of his canvases are in their house. His wife is a photographer whose pictures are also on the walls, and, surprise, surprise, she had a gallery exhibit in BA recently. . . So, on their end, you go from families who made a lot of money, probably providing things like beef or wheat or gold to future generations who can ride horses and play polo. so it goes. i doubt that springsteen has any intention of recording anything in wellington, florida. this is not a place you would retreat to in order to stoke the creative juices. these are purely the casual real estate transactions of people who have so much money that there is absolutely no consideration of whether or not said transaction is a "good" investment. they could care less if they are losing money. if another house they like better appears the day after the closing on house one, they'll buy that too, and then at some future point when they happen to think about it put house one back on the market. Kelly Ripa is also going down the Wellington road as well, as her little girl has gotten on the junior circuit in the hamptons. it's the hamptons in the summer, then all these horse people shift to wellington for the winter. every weekend either kelly or her husband go to wellington with their daughter on net jets or some equivalent. They also just finished building a sweet new pad on their 350+ acre property in Colts Neck, NJ... which seems to have been done very quietly. I have heard from someone who lives in their neighborhood in Rumson that they are no longer a couple, that they live separate lives in houses across the street from each other. Which would explain the purchase of two houses in Florida. Rumson because they have not lived in Rumson for several years, since they finished building their massive farmhouse in Colts Neck. Rumor has it that Springsteen's mother lives in their former Rumson house, which is why your friend would think they arent a couple. Queen Latifah lives in Colt's Neck, right? Mama do you know anything about her house? I love her! A friend of mine used to live in this house that Bruce just sold before her family sold it to him. The one he used to rent is right nextdoor to this one to the east, and the one he still owns is nextdoor to the west, so all 3 houses are in a row, with this one in the middle. I don't know why he bought 2. Georgina Bloomberg lives in the neighborhood and Michael Bloomberg owns a large property a stone's throw away. Beautiful. Love this site. Great humor, entertaining info. Thats pretty cool! Wellington is also now a 2nd home to Lorne Michaels of SNL fame & origination. Lorne bought a modest home (approx $700k).. Great for Palm Beach County real estate!